Valletta (; [ˈvɐlɛ.tɐ]) is the capital city of Malta, colloquially known as Il-Belt ([ˈil.bɛlt]; lit. "The City") in Maltese. Geographically, it is located in the South Eastern Region, in the central-eastern portion of the main island of Malta having its western coast with access to the Marsamxett Harbour and its eastern coast in the Grand Harbour. The historical city has a population of 6,444 (as of March 2014), while the metropolitan area around it has a population of 393,938. Valletta is the southernmost capital of Europe and the second southernmost capital of the European Union after Nicosia. Valletta contains buildings from the 16th century onwards, built during the rule of the Order of St. John also known as Knights Hospitaller. The city is essentially Baroque in character, with elements of Mannerist, Neo-Classical and Modern architecture in selected areas, though the Second World War left major scars on the city, particularly the destruction of the Royal Opera House. The City of Valletta was officially recognised as a World Heritage Site by UNESCO in 1980. The official name given by the Order of Saint John was Humilissima Civitas Valletta—The Most Humble City of Valletta, or Città Umilissima in Italian. The city's fortifications, consisting of bastions, curtains and cavaliers, along with the beauty of its Baroque palaces, gardens and churches, led the ruling houses of Europe to give the city its nickname Superbissima—Most Proud. The building of a city on the Sciberras Peninsula had been proposed by the Order of Saint John as early as 1524. Back then, the only building on the peninsula was a small watchtower dedicated to Erasmus of Formia (Saint Elmo), which had been built in 1488. In 1552, the watchtower was demolished and the larger Fort Saint Elmo was built in its place. In the Great Siege of 1565, Fort Saint Elmo fell to the Ottomans, but the Order eventually won the siege with the help of Sicilian reinforcements. The victorious Grand Master, Jean de Valette, immediately set out to build a new fortified city on the Sciberras Peninsula to fortify the Order's position in Malta and bind the Knights to the island. 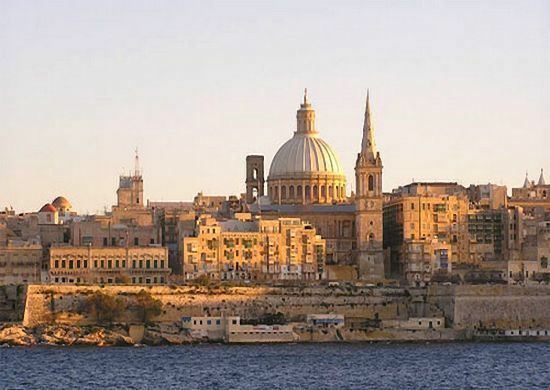 The city took his name and was called La Valletta. The Grand Master asked the European kings and princes for help, and he received a lot of assistance, due to the increased fame of the Order after their victory in the Great Siege. Pope Pius V sent his military architect, Francesco Laparelli, to design the new city, while Philip II of Spain sent substantial monetary aid. The foundation stone of the city was laid by Grand Master de Valette on 28 March 1566. He placed the first stone in what later became Our Lady of Victories Church. In his book Dell’Istoria della Sacra Religione et Illustrissima Militia di San Giovanni Gierosolimitano (English: The History of the Sacred Religion and Illustrious Militia of St John of Jerusalem), written between 1594 and 1602, Giacomo Bosio writes that when the cornerstone of Valletta was placed, a group of Maltese elders said: "Iegi zimen en fel wardia col sceber raba iesue uquie" (Which in modern Maltese reads, "Jiġi żmien li fil-Wardija [l-Għolja Sciberras] kull xiber raba’ jiswa uqija", and in English, "There will come a time when every piece of land on Sciberras Hill will be worth its weight in gold"). De Valette died from a stroke on 21 August 1568 at age 74 and never saw the completion of his city. Originally interred in the church of Our Lady of the Victories, his remains now rest in St. John's Co-Cathedral among the tombs of other Grand Masters of the Knights of Malta. Francesco Laparelli was the city's principal designer and his plan departed from medieval Maltese architecture, which exhibited irregular winding streets and alleys. He designed the new city on a rectangular grid plan, and without any collacchio (an area restricted for important buildings). The streets were designed to be wide and straight, beginning centrally from the City Gate and ending at Fort Saint Elmo (which was rebuilt) overlooking the Mediterranean; certain bastions were built 47 metres (154 ft) tall. His assistant was the Maltese architect Girolamo Cassar, later oversaw the construction of the city himself after Laparelli's death in 1570. The Ufficio delle Case regulated the building of the city as a planning authority. The city of Valletta was mostly complete by the early 1570s, and it became the capital on 18 March 1571 when Grand Master Pierre de Monte moved from his seat at Fort St Angelo in Birgu to the Grandmaster's Palace in Valletta. Seven Auberges were built for the Order's Langues, and these were complete by the 1580s. An eighth Auberge, Auberge de Bavière, was later added in the 18th century. In Antoine de Paule's reign, it was decided to build more fortifications to protect Valletta, and these were named the Floriana Lines after the architect who designed them, Pietro Paolo Floriani of Macerata. 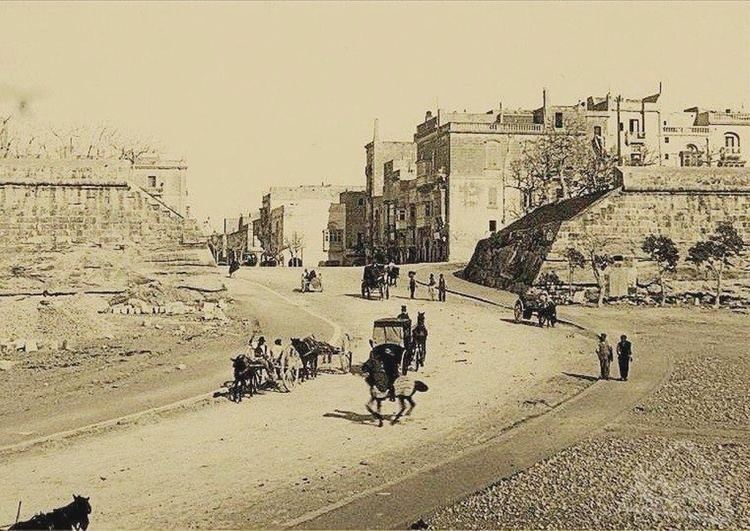 During António Manoel de Vilhena's reign, a town began to form between the walls of Valletta and the Floriana Lines, and this evolved from a suburb of Valletta to Floriana, a town in its own right. In 1634, a gunpowder factory explosion killed 22 people in Valletta. In 1749, Muslim slaves plotted to kill Grandmaster Pinto and take over Valletta, but the revolt was suppressed before it even started due to their plans leaking out to the Order. Later on in his reign, Pinto embellished the city with Baroque architecture, and many important buildings such as Auberge de Castille were remodeled or completely rebuilt in the new architectural style. In 1775, during the reign of Ximenes, an unsuccessful revolt known as the Rising of the Priests occurred in which Fort Saint Elmo and Saint James Cavalier were taken by rebels, but the revolt was eventually suppressed. In 1798, the Order left the islands and the French occupation of Malta began. After the Maltese rebelled, French troops continued to occupy Valletta and the surrounding harbour area, until they capitulated to the British in September 1800. In the early 19th century, the British Civil Commissioner, Henry Pigot, agreed to demolish the majority of the city's fortifications. The demolition was again proposed in the 1870s and 1880s, but it was never carried out and the fortifications have survived largely intact. 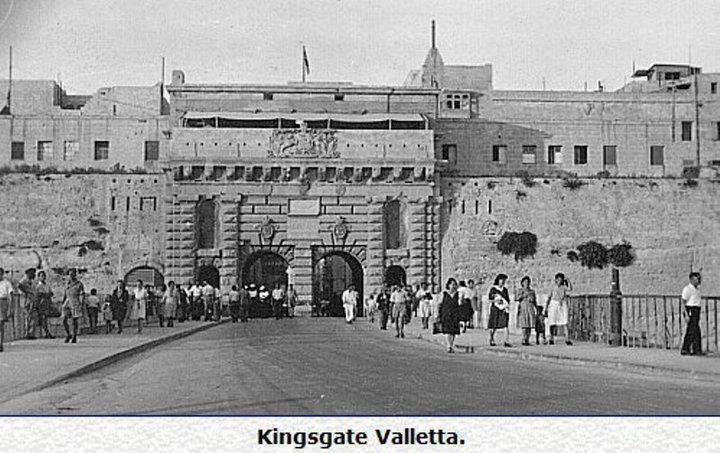 Eventually building projects in Valletta resumed under British rule. These projects included widening gates, demolishing and rebuilding structures, widening newer houses over the years, and installing civic projects. The Malta Railway, which linked Valletta to Mdina, was officially opened in 1883. It was closed down in 1931 after buses became a popular means of transport. Nazi and Fascist air raids throughout the Second World War caused much destruction in Valletta and the rest of the harbour area. The Royal Opera House, constructed at the city entrance in the 19th century, was one of the buildings lost to the raids. In 1980, the 24th Chess Olympiad took place in Valletta. The entire city of Valletta has been a UNESCO World Heritage Site since 1980, along with Megalithic Temples of Malta and the Hypogeum of Ħal-Saflieni. On 11 November 2015 Valletta hosted the Valletta Summit on Migration in which European and African leaders discussed the European migrant crisis. After that, on 27 November 2015 the city also hosted part of the Commonwealth Heads of Government Meeting 2015. Valletta has been selected as the European Capital of Culture for 2018. The Valletta Local Council was established by the Local Councils Act of 1993, along with the other local councils of Malta. The first election was held on 20 November 1993. Other elections were held in 1996, 1999, 2002, 2005, 2008, 2013, and the next elections are set to be held in 2017. The local council is currently housed in a building in South Street. Since the city has been selected as the European Capital of Culture, the council began to look for new premises at a more central location. Various proposals were made, including the Main Guard, the Grandmaster's Palace, Fort Saint Elmo and the former HSBC offices, but nothing has been decided as of 2015. Valletta is the capital city of Malta, and is the country's administrative and commercial hub. The Parliament of Malta is housed at the Parliament House near the city's entrance since 2015, and it was previously housed at the Grandmaster's Palace in the city centre. The latter palace still houses the Office of the President of Malta, while Auberge de Castille houses the Office of the Prime Minister of Malta. The courthouse and many government departments are also located in Valletta. The Valletta peninsula has two natural harbours, Marsamxett and the Grand Harbour. The Grand Harbour is Malta's major port, with unloading quays at nearby Marsa. A cruise-liner terminal is located along the old seawall of the Valletta Waterfront that Portuguese Grandmaster Manuel Pinto da Fonseca built. 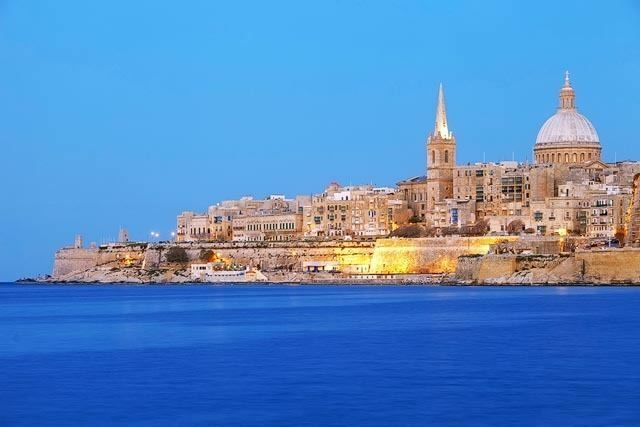 Valletta features a Mediterranean climate with warm, dry summers and mild, wet winters. 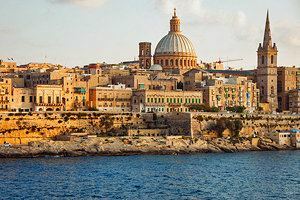 Valletta experiences a lack of precipitation during the summer months and heavier precipitation during the winter months. Winter temperatures are moderated by the city’s proximity to the sea. As a result, Valletta enjoys mild winters. The official climate recording station in Malta is at Luqa Airport, which is a few miles inland from Valletta. Average high temperatures range from around 16 °C (61 °F) in January to about 32 °C (90 °F) in August, while average low temperatures range from around 10 °C (50 °F) in January to 23 °C (73 °F) in August. The Köppen Climate Classification subtype for this climate is "Csa" (Mediterranean Climate). The architecture of Valletta's streets and piazzas ranges from mid-16th century Baroque to Modernism. The city is the island's principal cultural centre and has a unique collection of churches, palaces and museums and act as one of the city's main visitor attractions. When Benjamin Disraeli, future British Prime Minister, visited the city in 1830, he described it as "a city of palaces built by gentlemen for gentlemen," and remarked that "Valletta equals in its noble architecture, if it does not excel, any capital in Europe," and in other letters called it "comparable to Venice and Cádiz" and "full of palaces worthy of Palladio." Buildings of historic importance include St John's Co-Cathedral, formerly the Conventual Church of the Knights of Malta. It has the only signed work and largest painting by Michelangelo Merisi da Caravaggio. The Auberge de Castille et Leon, formerly the official seat of the Knights of Malta of the Langue of Castille, Léon and Portugal, is now the office of the Prime Minister of Malta. The Magisterial Palace, built between 1571 and 1574 and formerly the seat of the Grand Master of the Knights of Malta, used to house the Maltese Parliament, now situated in a purpose built structure at the entrance to the city. The Magisterial Palace still houses the offices of the President of Malta. The National Museum of Fine Arts is a Rococo palace dating back to the late 1570s, which served as the official residence of the Commander-in-Chief of the Mediterranean Fleet during the British era from the 1820s onwards. The Manoel Theatre (Maltese: Teatru Manoel) was constructed in just ten months in 1731, by order of Grand Master António Manoel de Vilhena, and is one of the oldest working theatres in Europe. The Mediterranean Conference Centre was formerly the Sacra Infermeria. Built in 1574, it was one of Europe's most renowned hospitals during the Renaissance. The fortifications of the port, built by the Knights as a magnificent series of bastions, demi-bastions, cavaliers and curtains, approximately 100 metres (330 ft) high, all contribute to the unique architectural quality of the city. l-Arċipierku – an area close to the Sacra Infermeria. Its name possibly derives from archipelago since it contains a number of lanes which break up the area into many "islands" of houses, or from archi-borgo since the area is located just outside Fort Saint Elmo. il-Baviera – an area around the English Curtain, bounded by Old Bakery, Archbishop, Marsamxett and St. Sebastian Streets. It is named after Auberge de Bavière. il-Biċċerija – an area close to il-Baviera, named after the slaughterhouse which was formerly located there. il-Camerata – an area close to the Sacra Infermeria. It is named after the Camerata, a spiritual retreat which was demolished in the 19th century and replaced by social housing. Deux Balles (Maltese: Duwi Balli) – an area close to il-Baviera. The name probably originates from the French occupation. il-Fossa – an area close to the Jews' Sally Port and Fort Saint Elmo. It is regarded as the worst maintained area of Valletta. Manderaggio (Maltese: il-Mandraġġ) – an area behind Manderaggio Curtain, bounded by St. Mark, St. Lucia, St. Patrick and Marsamxett Streets. This was meant to be a small harbour (mandracchio) but it was never completed, and a slum area developed instead. The slums were demolished in the 1950s and were rebuilt as housing estates. Valletta has been designated European Capital of Culture for 2018. Saint James Cavalier, originally a raised gun platform, was converted into a Centre of Creativity in the year 2000 as part of Malta's Millennium Project. It now houses a small theatre, a cinema, music rooms and art galleries. Various exhibitions are regularly held there. Since it was opened it has welcomed over a million visitors. The Valletta International Baroque Festival is held every year in January. Jazz music in Malta was introduced in the Strait Street area, frequented by Allied sailors during both world wars. Malta's Jazz Festival took place here. Strait Street is also known as The Gut. This area is undergoing a programme of regeneration. The city's dual band clubs are the "King's Own Band Club" (Maltese: L-Għaqda Mużikali King's Own) and "La Valette National Philarmonic Society" (Maltese: Is-Soċjetà Filarmonika Nazzjonali La Valette). Valletta is the scene of the Maltese Carnival, held in February leading up to Lent. Malta International Airport serves Valletta, with the airport located 8 kilometres (5.0 mi) from the city in the town of Luqa. Malta's public transport system, which uses buses, operates mostly on routes to or from Valletta, with their central terminus just outside the city's entrance. Traffic within the city itself is restricted, with some principal roads being completely pedestrian areas. In 2006, a park and ride system was implemented in order to increase the availability of parking spaces in the vicinity of the city. People can leave their personal vehicles in a nearby Floriana parking lot and transfer to a van for the rest of the trip, which takes a mere few minutes. In 2007 a congestion pricing scheme was implemented, the Controlled Vehicular Access system, in order to reduce long-term parking stays and traffic while promoting business in the city. An ANPR-based automated system takes photos of vehicles as they enter and exit the charging zone and vehicle owners are billed according to the duration of their stay. Various exemptions and flexible billing rules make the system the next evolutionary step of systems like the London congestion charge programme. Main differences from the London system include ex post invoicing (with financial incentives/penalties for early/late payment), prepayments not day-specific, hourly instead of daily rates, a maximum daily charge (8 hours), free dashes (free if duration under 30 minutes), defined free access periods for delivery and service vehicles. Valletta is served by a fleet of electric taxis which transport riders from 10 points in Valletta to any destination within the city. Valletta's Marsamxett Harbour a "Regatta" (Rowing) Team, which takes part in the annual traditional Regatta on Victory Day (8 September).